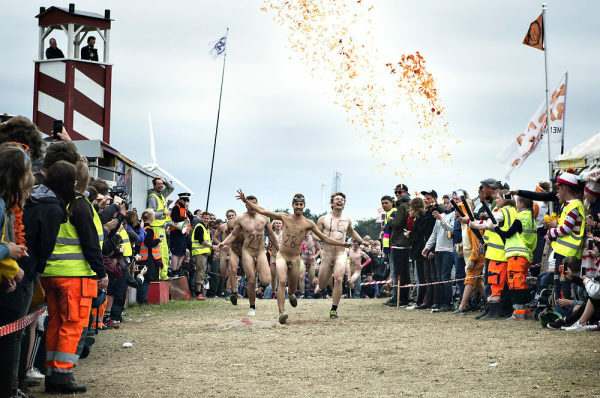 The 2017 Naked Run at Roskilde festival ended just a few ours ago and was a success with thousands of viewers. Taking place at the Dream City, inside the festival area, the run counted with around 30 contestants, one of them on a weel chair. This year it was a close race and 18 year-old Ana from Brasil and 30 year-old Michael were the winners of 2017 Naked Run. Organised by Roskilde Festival Radio, it takes place on the Thursday of the festival ant the contestants run around the campsite. But it’s not all just fun and games like life drawing for example, as one male and one female winner are chosen – each receiving a ticket to next year’s festival. With approximately 30 contestants each year, the competition is fierce. Below you can see the replay of the live broadcast by the danish newspaper Metro Express.